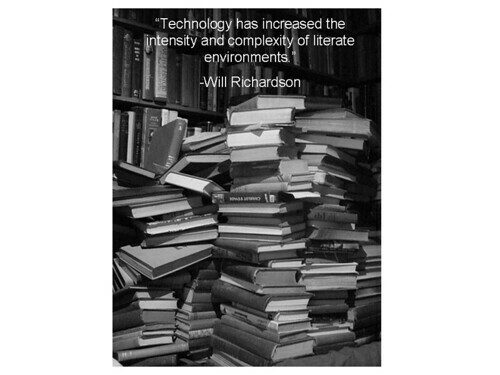 This image and quote from Richardson is representing technology and how it is evolving the complexity of the changing spaces or reading and writing. New forms of representation are developing with the use of new media and it changes the face of literacy. Communication is now done through a multitude of mediums and sometimes by using symbols, characters, emoticons, pictures, etc. The common space of reading and writing is allowing people to share information, collaborate and learn together with anyone in the world. Barriers and frontiers between people are progressively disapearing. Hence, more than ever, people have to use their critical thinking skills as they look up for valid resources in the Web environment because not everything is equally good to read. I am an online teacher at www.apprentissageenligne.org. I teach senior French courses (and one sociology course) to students from French high schools from all around the province of Ontario. Prior to that, I taught face to face in the South West of Ontario, Windsor, where I still work as my office is in the school. I taught in Schefferville and Québec, in the province of Quebec, and in Baton Rouge, in Louisiana. I also had the opportunity to single write two textbooks (grade 9 and grade 11) that are actually used in the French high schools in Ontario. Of couse, I believe that there is still a place for textbooks in education! This is my 9th course in the program and I am still very excited to be part of this great learning community. What a privilege this is!! And, finally, on a personal note, I am the proud mother of two sons from whom I have learned how precious life can be. I am looking forward to learn from all of you. This entry was posted in Introductions and tagged literacy, media, printing, reading, technology, text, writing. Bookmark the permalink.